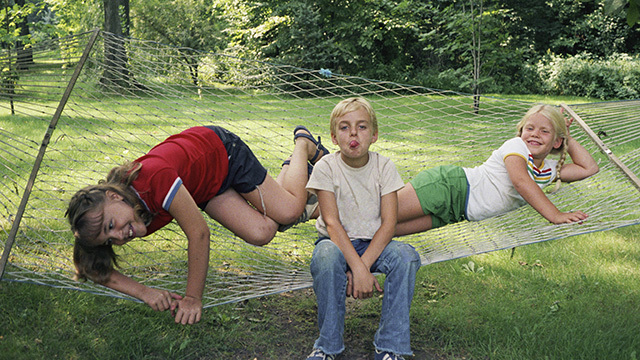 Ahead of National Middle Child Day, some have recently pondered whether middle children are “going extinct.” Yet new data on the number of children Americans see as “ideal” suggest that middle-child families could become more popular again: Roughly four-in-ten U.S. adults (41%) think families of three or more children are ideal, a share rivaling that of around two decades ago, according to a recent Gallup survey. 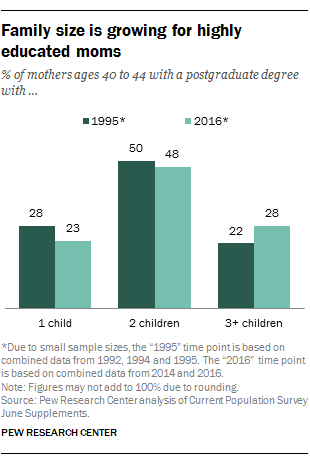 The current share of adults who see three or more children as the ideal family size is the highest since 1997, when, amid a thriving economy, 42% said this. However, it is still far below the share in 1967 and earlier, when a clear majority of Americans said three or more is the ideal number. Americans’ preference for families with three or more children began to decline after the Baby Boom era and through the 1970s and ’80s. It reached a low of 28% in 1986, after a period of multiple recessions. When it comes to the number of children that U.S. women are actually having in their lifetime, it’s still much more common for women at the end of their childbearing years to have had one or two kids than three or more, according to a Pew Research Center analysis of U.S. Census Bureau data. 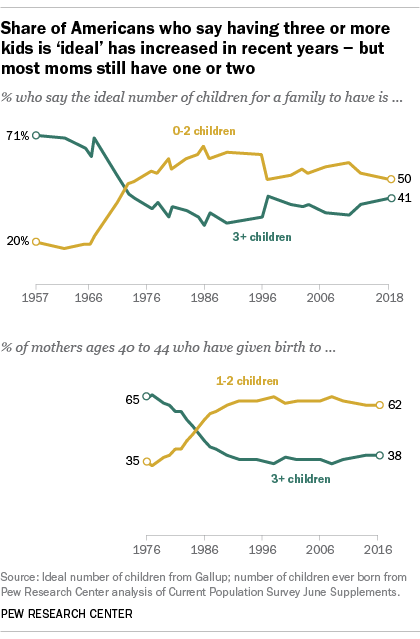 In 2016, about six-in-ten U.S. mothers ages 40 to 44 (62%) had given birth to one or two children, while just 38% had three or more. That’s roughly the inverse of 1976, when about two-thirds of mothers in this age range (65%) had three or more kids and 35% had one or two. 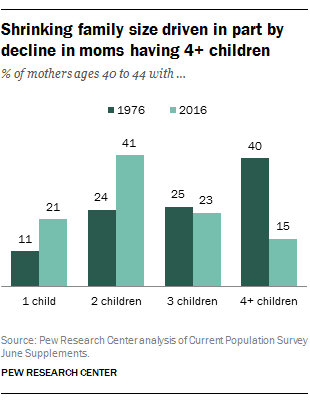 A sharp decrease in the share of mothers with four or more children has played a role in the long-term decline in larger families, according to the Census Bureau data. In 1976, four-in-ten moms in their early 40s had given birth to four or more children. But by 2016, the share had shrunk to just 15%. The three-child family, by contrast, has held relatively constant: In both 1976 and 2016, roughly a quarter of mothers ages 40 to 44 had given birth to three children. Despite the dramatic decline of the four-child-plus family over the past few decades, the share of Americans who see four or more children as the ideal number is actually ticking upward. In 2007, 9% of Americans said the ideal number of children is four or more, according to Gallup. That share grew following the Great Recession and now stands at 15%. In fact, since 2007, the increase in the average number of children Americans see as ideal is mainly due to a rise in the share of adults who think four or more kids is the ideal family size. The number of children a family has, as well as views of the ideal number of children, vary by educational attainment. On average, the more education a mother has, the fewer children she will have in her lifetime, as previous Pew Research Center reports have shown. In combined data for 2014 and 2016, 46% of mothers ages 40 to 44 with a high school diploma or less had given birth to three or more children. By comparison, among mothers in the same age group with a postgraduate degree, 28% had given birth to three or more kids. But the educational “gap” in fertility has somewhat narrowed in the past two decades, driven by declining childlessness and a rise in larger families among highly educated moms. The share of mothers ages 40 to 44 with at least a master’s degree and three or more children increased from two decades ago, as the share with just one child declined. According to previous research by the Center, highly educated women are the only group with a declining share of one-child families and a rise in families of three or more. When it comes to ideal family size, highly educated adults are again less likely to say having three or more children is ideal, according to Gallup. Among those with a postgraduate degree, 36% believe three or more kids are ideal, compared with 46% of those with no college education. However, since 2011, the share of Americans who see families of three or more children as ideal has risen among all levels of education.